Jaagstkilda | Striving to preserve our highly sought after sense of community values and protecting our local heritage. Police have asked for residents to call 000 for all Police related matters in our community and not to call the local police station (unless you are specifically in contact with a representative). 000 calls are all logged and provide police with statistics which enables them to allocate resources where required on an on-going basis. Note: The police will need to prioritise your calls depending on danger to people etc. Your feedback is now sought on the draft Graffiti Management Plan 2019-24 developed by Council following a four-week engagement program that sought community feedback on priorities for managing graffiti within the city. The Association says the allocation is in effect $1.5 mil grant to Housing First (formerly Port Phillip Housing Association) which was un-budgeted and that Councillor Simic who sits on the board of Housing First, voted in favour of it. At a Council meeting on 6 March 2019, Councillors Baxter, Brand, Copsey, Crawford and Simic all supported a motion to provide grants of up to $1.5M for social housing against the advice of Senior Council Officers and in circumstances where the benefits to be derived are highly uncertain. Councillors Bond, Gross, Pearl and Voss opposed the motion. Who is the Port Phillip Ratepayers’ Association? They are a concerned community group taking action to stop the Council’s wasteful spending and reduce our annual rates. They say their frustration stems from being gouged with continual, and in many cases significant rate increases year on year and then to find and see the Council waste millions on pet projects, irrelevant spending, poor asset management and with no apparent regard to fiscal responsibility for ratepayers. St Kilda Junction PTV Substation – update March 2019. The Department of Transport have been working with City of Port Phillip to co-ordinate a detailed project plan for a joint study for the Junction. The study intends to firstly assess the urban design and amenity issues affecting all transport users, residents and workers throughout the area. The study will also collect background data to inform a set of strategic directions and principles for the future movement and place functions for the Junction. The Inner Metropolitan Partnership Assembly meetings will continue through 2019 and JAAG will continue to contribute to these forums. St Kilda Junction is one of the most complex convergence of roads in Port Phillip (Queens Road, St Kilda Road, Punt Road, Fitzroy Street and Barkly Street). It serves as a gateway to Fitzroy Street, St Kilda Beach and the foreshore, and remains a key intersection for vehicular, bicycle, walking and public transport movements. 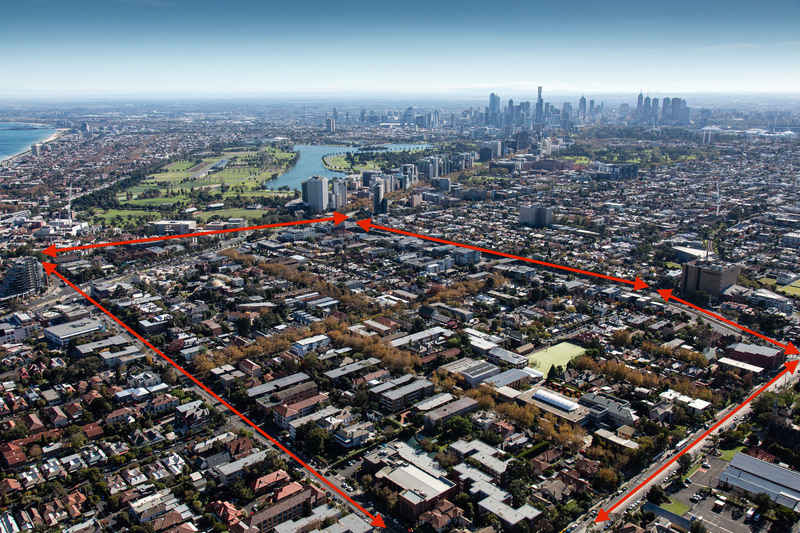 The last five years has seen increased high scale residential development south of St Kilda Junction ranging from 8 to 26 storeys. The increased growth has impacted on the local amenity and changes are required to protect and enhance the liveability of new residents. To read more about JAAG’s involvement in the development of a masterplan see Recent Posts on the right hand side of this web page. Chipton Park Update (formerly known as Crimea Reserve) – update 13 November 2018. Removing the bluestone garden bed on the footpath corner. Relocating some seats, the picnic table and bins onto the nature strip to create a larger grass space. This will also make the nature strips feel like they’re part of the park. Buffer planting to the adjacent roads. Reducing the width of the garden beds in the back corner of the park. This will mean the existing spotlight will effectively provide safety lighting to this space. Consolidating the entry pavement and seating walls so they’re usable but don’t take too much valuable green space. A selection of play equipment for all ages with integrated nature play such as rocks, logs and log steppers. Retaining the Zelcova serrata tree in the playground for its shade value. Relocating the Australia Post distribution box to outside the park. There will also be an automatic irrigation system included as part of the upgrade. Community consultation now closed https://haveyoursay.portphillip.vic.gov.au/.